Magasin Göteborg was distributed for the seventh time in a row as a supplement to the trade journal Dagens Industri on the 16th of May 2018. The magazine reached about 210,000 readers this year and has had very good results in the reading survey. It is one of Dagens Industri’s most read supplements. “Stories from the City with Attitude” was the theme of this year’s magazine. Brave and innovative entrepreneurs, researchers and innovators who truly believe in their project and in their city are lifted in the magazine, showing the diversity of companies located in Gothenburg and its region. A reading survey based on 300 interviews with different age groups shows that Magasin Göteborg has a long reading time, over nine minutes, evenly distributed throughout the magazine. It is a popular product with satisfied readers who appreciate the news value. This year, the magazine has also reached a younger group up to 34 years. Compared with similar products, the reading value is high for Magasin Göteborg, which is still one of Dagens Industri’s most read supplements. Published by Pauline Pontois 16 May, 2018 in Trade and industry group. Magasin Göteborg was distributed as a supplement to the trade journal Dagens Industri on the 16th of May 2018. The theme for this year is “Stories from the city with attitude” and how this idea is expressed in Gothenburg. 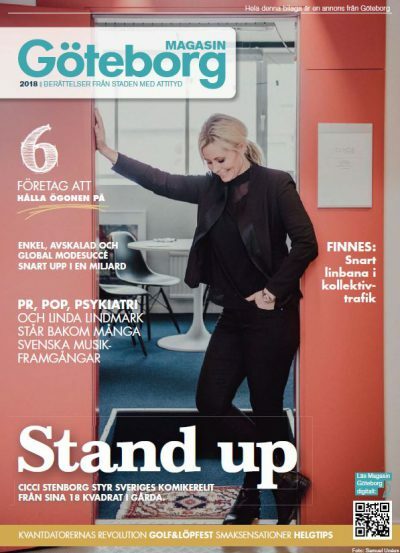 The magazine is published on behalf of Business Region Göteborg and the Trade & Industry Group at Göteborg & Co. Attitude and the will to succeed are vital elements in the city’s development. This year, Magasin Göteborg turns the spotlight on entrepreneurs, scientists and innovators who truly believe in their projects and their city. What do Gothenburg companies see as the keys to export success? How could a quantum computer help to develop self-driving cars? Which are the hottest companies to watch in the city right now? You can also read about the importance of artificial intelligence to Stena Line, big projects that are being planned for Gothenburg’s 400 years anniversary in 2021, about the queen of entertainment, Cissi Stenborg, and much more. The purpose of Magasin Göteborg is to showcase all the innovative people and the diversity of companies and events in the region, which together make Gothenburg an even more attractive city to work in, live in and visit.